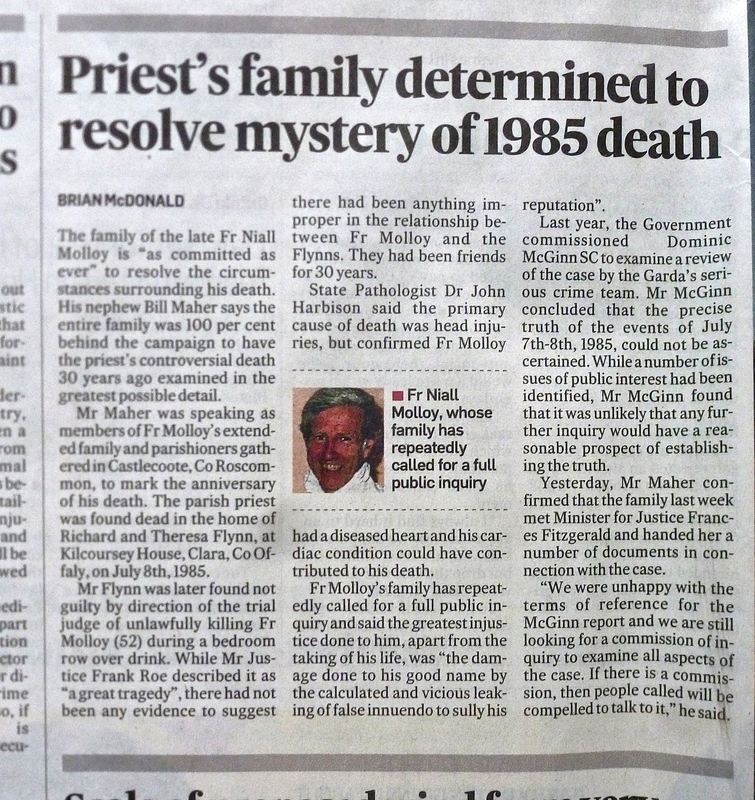 NOBODY will face charges arising from the killing of Fr Niall Molloy almost 30 years ago. The Director of Public Prosecutions has concluded an examination of a garda file on the killing of the former parish priest of Castlecoote in Co Roscommon, and directed that no charges should be brought. The decision was not unexpected. The garda cold-case investigation of the murder re-examined the major issues raised, as well as a number of fresh allegations, and produced no evidence of a new suspect. The family of Fr Molloy said they would now press ahead with their demand for a commission of inquiry, to investigate all of the circumstances surrounding the priest’s death. The 52-year-old priest was found beaten to death at the home of his friends Richard and Teresa Flynn in Clara, Co Offaly, on July 8, 1985. Businessman Richard Flynn was charged with the manslaughter of Fr Molloy and causing actual bodily harm, but at the 1986 trial, Judge Frank Roe directed the jury to return a not-guilty verdict. “We’re going to press ahead now for a commission of inquiry, which is what we always wanted”, Fr Molloy’s nephew, Bill Maher said.